Osaka, Japan — Over 1 billion years ago, a relationship began between the ancestor of all living plants and a type of bacterium that paved the way for the evolution of life as we know it. The single-celled algal ancestor engulfed, but crucially did not destroy, a cyanobacterium-like organism with which it established a mutually beneficial bond. This symbiotic relationship provided energy in the form of sugars derived from photosynthesis (whereby sunlight is converted into chemical energy) from the cyanobacterium to its host. The symbiont cell eventually became the first chloroplast. Even today, these organelles hold on to structures from their early days as independent organisms, including their own DNA and a double membrane. During evolution, several chloroplast-encoded genes transferred to the host's nuclear genome. Thus, in modern plant and algal cells, many nuclear-encoded chloroplast proteins synthesized in the cytosol of the cell must be imported across both the outer and inner chloroplast membranes in a process that requires energy. "We identified another huge novel protein complex, twice the mass of TIC, which is made up of six related proteins with one accessory protein, and functions as the import motor in a close association with TIC," says Nakai. "Surprisingly, the six related components all evolved from an enzyme contained within the ancestral cyanobacterium-like endosymbiont that degraded unwanted proteins after extracting them from the membrane." "These findings revolutionize the molecular model of chloroplast protein import, and help us understand the evolution of plant and algal chloroplasts," explains Nakai. "This understanding could aid biotechnological improvements in the efficiency of crop photosynthesis, or the development of plants and algae as factories that manufacture or store proteins in their chloroplasts." 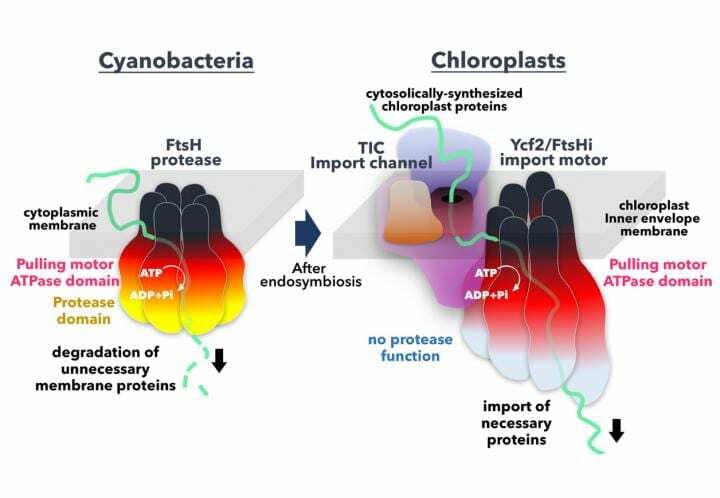 This article, "A Ycf2-FtsHi heteromeric AAA-ATPase complex is required for chloroplast protein import" was published in The Plant Cell at DOI: https://doi.org/10.1105/tpc.18.00357.